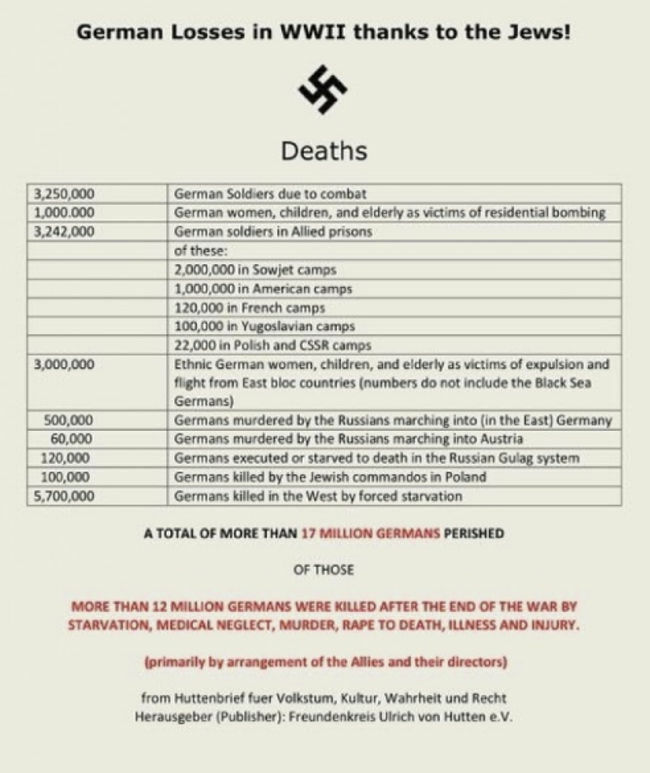 [The Jewish scum are forever whining about their stupid mythical 6 million "holocaust”, which never happened. I am glad to report though, that according to David Irving, that the Germans did shoot a few thousand Jews into pits during WW2, which they definitely deserved. The Germans did not do these things lightly. Rest assured the Germans were killing "partisans”, really, Jewish communist terrorists, operating behind the front lines. According to the rules of war you are allowed to execute anyone operating behind your lines. The entire 6 million Jews being gassed, story, is complete hogwash. That never happened. 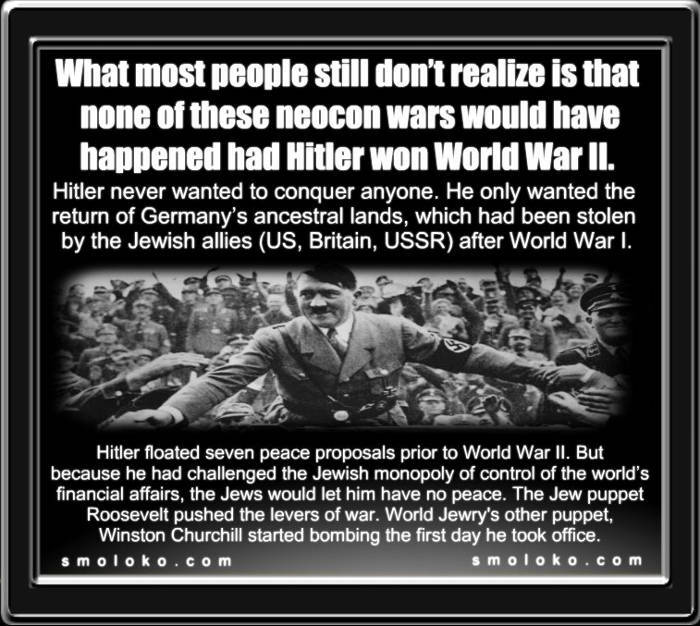 Most of the Jews had left Germany before WW2 even started. ‘Enjoy the war while you can – the peace will be terrible’. Four times more Germans died in the surrender of Germany than during the entire war. I also have charts of German army casualties during WW2. For most of the war, German losses were not high. German civilians were murdered by allied air crews. But the worst awaited the Germans after the war. In that sense, it reminds me of what has happened to us whites in Africa, especially South Africa. Stacks of whites were MURDERED after “peace” with the blacks. The last time I saw anyone doing any calculations, it was that over 80,000 whites have died DURING “PEACE” after Apartheid. I assure you, that the actual deaths of whites during our wars were less than 5% of the actual total that occured by MURDER (& even torture), after the war, in the so-called “New South Africa”. In fact, 5% might even be an over-estimate. If you’re a “racist” (i.e. pro-White), the Anglo-American political system is quite happy to either murder you outright or to let the others (e.g. Russians and Blacks) murder you. This is because of the Jewish hatred of whites. 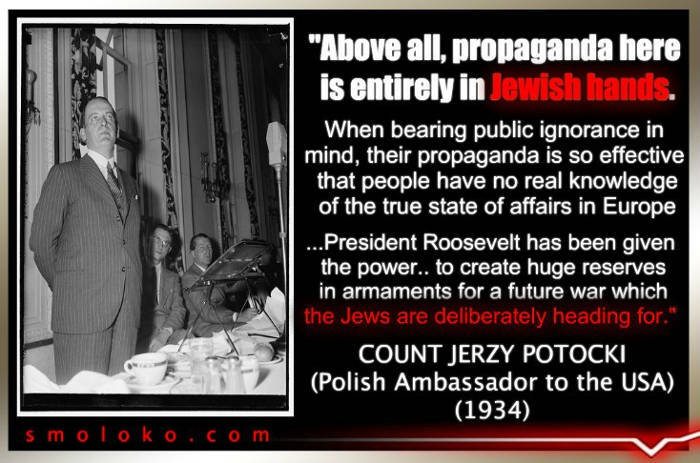 Its the Jews who engineered WW2, and the Jews totally took over and dominated the Nuremberg Trials, where they sent fine German officers and leaders to their deaths based on the bogus charges against them.